A trans woman in the Philippines has called out guards working on the country’s Metro for discriminating against her for her gender identity. Mikki Galang said that she was approached by guards at a metro station when she was queueing in a female only lane. The guard then told her that “boys” were not allowed to queue in that area. The exchange was recorded by a friend of Galang’s, and the video has since gone viral on social media. The guard then asked her not to be offended by the line of questioning, and said that he was only asking her to leave as other commuters had complained about her being in the courtesy lane. In a Facebook post along with the video, Galang said that she has to use the metro as she has no car. “I want to be an efficient working person, and to not contribute to the traffic anymore,” she added. In the post, Galang – who is a blogger – detailed how she encouraged her friends to ride the metro with her. However, the situation became tense after they entered the female line. 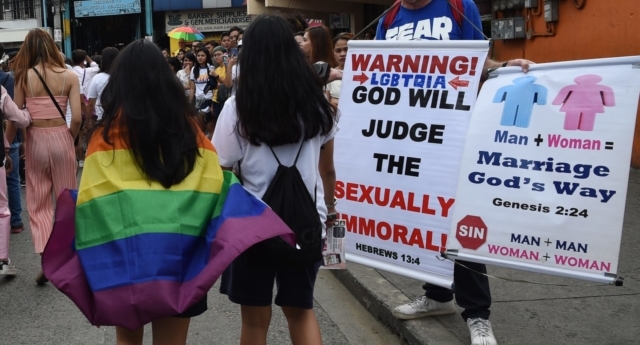 Equal marriage is still not a reality in the Philippines, and just last year, the country’s president Rodrigo Duterte refused to acknowledge the legitimacy of trans people. Meanwhile, in July, police stations began to introduce LGBT+ desks in a bid to tackle hate crimes. The desks are designed to handle all cases relating to hate crimes or harassment of LGBT+ people.